When you start to go out on portable activities, you are confronted with the question what power source you should use. In this post I will share the choices I made working barefoot. The reason to share this info now is that I am in the middle of constructing something for my new mobile amplifier.. but more on that in a future post. The challenge depends on your operating conditions. Suppose that you are not going to work QRP and you will not be in or near your car. This is the situation I faced when I started activating special locations like nature reserves and castles. Working with a 100W set, the power source you are looking for needs to supply you with approx 16A @13v, for as long as possible but with minimum weight. The good news is that there are a lot of other crazy hobbyists out there that face the same challenge. You will find them when you search for "RC" - remote controlled cars, planes, helicopters and more recently drones. These people have turned to LiPo (Lithium Polymer) and LiFePO4 (Lithium Iron Phosphate) batteries for their power. LiPo and LiFePO4 have the best power to weight ratio of the power sources I compared. LiPo batteries consist of a set of 3.6V cells (between 3V - discharged and 4.2V - fully charged). LiFePOo4 batteries consist of a set of 3,2V cells (between 2,8V - discharged and 3,6V - fully charged). 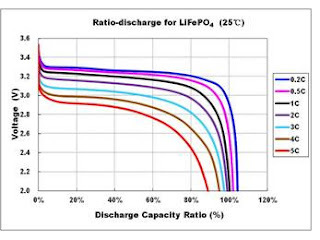 LiFePO4 batteries are intended for high power applications. They exhibit a more constant discharge voltage and are considered to offer better safety than other Lithium-based batteries. With this list in mind I initially chose to go for LiFePO4 batteries. The biggest I could find were 9.7Ah, capable of delivering 10C (meaning that the peak current is 10x the capacity). With a weight of around 1kg, they fit my requirements well. After 3 years of working with these batteries I have found that the capacity has deteriorated to the point that it starts to annoy me. I can barely run an activity of 2h on two batteries. When adding a new battery to my collection, I chose a LiPo this time. The main reason to choose this battery over a new LiFePO4 is that I found them in larger capacity (16Ah). When you are going to select your battery you need to understand one more thing: a code with #S#P. 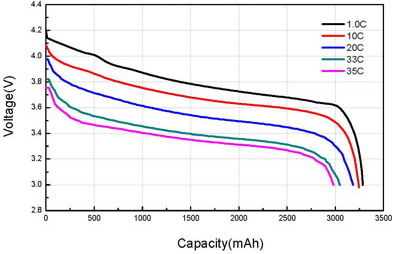 This tells you the amount of cells the battery has in series and in parallel. The amount of cells in parallel is not that interesting, as it is the given design for the capacity you are buying (and that number is clearly defined in mAh). The amount of cells in series is more interesting as it tells you what voltage range the battery will operate in. There is of course not one voltage for a battery. It varies along its discharge curve. The good news is that the discharge curve is rather flat. Your radio is most probably happy to take 12-14V. With a LiFePo4 you should therefore go for a 4S version. The voltage of this battery varies between 14,4V (full) and 11,2V (discharged) - most of the time around 12,8V. If you decide to go for a LiPo battery, then you can either go for 3S (voltage between 9-12,6V) or 4S (voltage between 12-16,8V). Looking at the discharge curve, you will find that with a 3S battery you will quickly drop to a voltage where your radio might not operate anymore or with less output. I used this with my FT-817 and it is a workable solution. At a higher current draw with my FT-857 I found that the battery was unusable too soon. I therefore decided to go for a 4S version. If you have chosen a LiFePO4, you are ready to go out and activate whatever place you want to. If you went for the LiPo S4 you have one more challenge to go: your set probably won't like the 16.8V of your fully charged battery. So how do you bring this voltage to an acceptable range? I chose a buck (step down) converter to do the job. You can find them on ebay rather cheaply (imo) as complete modules with adjustable output voltage. I only added a few capacitors and now have a steady 13V LiPo battery with 16Ah capacity. One other thing to look at are the connectors of the battery. They come in different shapes. Most commonly used are the XT60 and the bullet connectors. 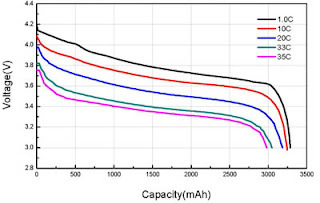 The latter are used on higher capacity batteries. I decided to standardise on one type of connectors - in my case the bullet connectors (as you can see from the buck convertor). So I have made conversion cables to go from different types of connectors (XT60, banana plugs, car cigarette lighter) to bullet connectors. That is about it regarding power sources for portable operation. In a future post I will zoom in on working with an amplifier while working portable. Hi Dave, thanks for the comment. LiFePO4 are the most practical considering the voltage. When you buy a better quality than I did, they should last long. 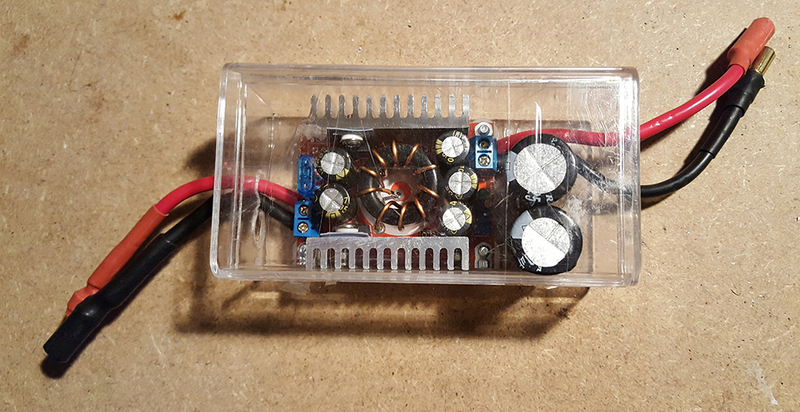 I have been using LiPo 16Ah (brand name: Turnigy) ever since I wrote this article (1.5 years now) and I am pleased with the results so far - using the stepdown converter to keep the voltage in a safe range. I can go for hours on one battery. Good luck with figuring your set-up out.